Each mouse is anesthetized and given D-luciferin i.p. • Bio Medic Data Systems, Inc. (BMDS) implantable microchip system, specifically the DAS-5002 Notebook System and the IPTT-300 Implantable Programmable Temperature Transponders. The DAS-5002 Notebook System is a portable hand-held reader-programmer used to program and scan BMDS temperature microchips. • The Plasmodium berghei ANKA strain PbGFP–LUCSCH expresses a GFP-luciferase fusion protein under the schizont specific promoter of the P. berghei ama1 gene. The fusion protein is expressed in the schizont stage but also in the very early ring stage. Parasites from frozen stocks of this strain are propagated and maintained in BALB/cByJ mice. The parasites are preserved in Alsever’s solution containing 10% glycerol and stored in liquid nitrogen. a. Before and during microchip implantation procedure, mice are lightly anesthetized with isoflurane to minimize any undue movement. b. The microchip is placed under the skin, between the scapular bones, with a 16-gauge needle placement device. c. The Bio Medic Data Systems (BMDS) implantable microchip system is then used to identify each mouse and obtain body temperature. d. With the use of the BMDS hand-held wand, body temperature is collected from each mouse while it is in its own cage, without any need for physical restraint. a. The Plasmodium berghei ANKA strain PbGFP–LUCSCH is used for all infections. b. Mice are infected intraperitoneally (i.p.) with 1x106-parasitized red blood cells obtained from a donor mouse. a. Blood is obtained from the very tip of the tail by clipping it with a clean razor. b. Approximately 5 µL of whole blood is then fixed in 1 mL of 0.25% glutaraldehyde and stored at 4°C before being stained. c. Fixed blood is incubated for 1 h at 37°C in the dark with 1 µM Hoechst 33258 in PBS, and samples are analyzed by cytofluorometry. d. A 424DF44 filter is selected as the emission filter for the blue Hoechst fluorescence. e. Data are recorded and analyzed by Cellquest 3.2 software. f. Erythrocytes are gated by forward and side scatter and infected erythrocytes are counted by Hoechst fluorescence. g. For each sample, 10,000 events are acquired and recorded. Figure 1. 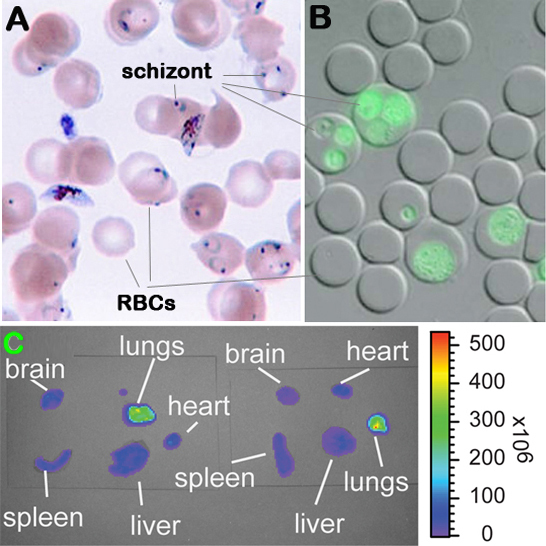 Malaria parasite (Plasmodium berghei) infected erythrocytes and detection of parasitemia and bioluminescence. Panel A: Giemsa stained blood smear. Panel B: Flourescent microscopic image of infected erythrocytes. Panel C: Visualization of luciferase activity in individual organs. a. Infected moribund mice are anesthetized by isoflurane gas inhalation before administering D-luciferin intraperitoneally. b. 2 to 4 min after injection with D-luciferin, mice are euthanized and the organs dissected without perfusion and placed in a Petri dish for imaging. c. Luciferase activity in dissected organs is then visualized and recorded with intensified-chargecoupled device (I-CCD) photon counting video camera of the in vivo imaging system (IVIS), with a 10 cm field of view (FOV), a medium binning factor, and exposure times between 10–60 s. Rainbow images show the relative level of luciferase activity ranging from low (blue), to medium (green), to high (yellow, red) (see Figure 1C above). d. Measurements are done using fixed time and region-of-interest settings with the programs LIVING IMAGE (Xenogen) and IGOR-PRO. e. Relative photon counts of each intact organs are calculated as a percentage of the total photon counts of all organs examined.